I received my new golf bag today. Thank you very much its terrific. Thank you kindly, it looks fantastic! !, are you happy with how it has come out? Thank you very much Kerstin, the bag has arrived and looks great. Many thanks for you help in speeding up this service. 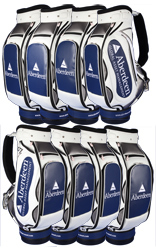 Masters Staff Bag "Tour Edition"
Aberdeen is delighted with their golf bags and would like to order 2 more. 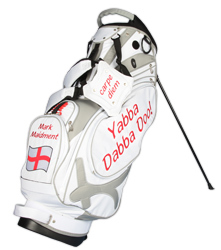 Many thanks for the golf bag,absolutley fantastic! Hi Kerstin, hope you are well. I just thought I would send a quick note to thank you. Today I received the bag I ordered from you. I must say I'm impressed not only with the speed of service, but also the communication that I have received. The bag looks superb and I'm impressed with the quality. Once again thanks very much, I will certainly be recommending your products to others. My bag arrived today I think and my parents sent me some pictures of it. I just wanted to say a massive thank you. The bag looks absolutely amazing and it is just what I wanted. Your correspondence was fantastic and I can't believe how fast you got the work done and sent to me. Thank you so much and I will recommend you to everyone.